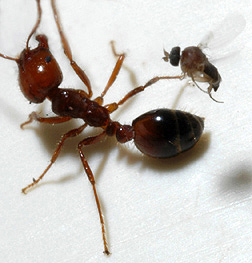 A parasitic phorid fly attempts to lay an egg into a fire ant worker. If the fly injects microsporidian-infected eggs into the ant, or the ant kills and eats the fly, the fire ant will become infected and die. Red imported fire ants (RIFA), native to South America, accidentally landed in the United States in Mobile, Alabama, during the 1930s and advanced across the southern region. For more than 20 years, two ARS labs—one in Argentina and the other in Florida—have been collaborating in studies of RIFA biology and biocontrol in hopes of controlling the pest’s numbers in the United States. The hunt for biological control of imported fire ants began in the 1970s in Brazil. The program at ARS’s South American Biological Control Laboratory (SABCL) in Hurlingham, Argentina, started in 1987. Staff there have since conducted well over 340 field trips in Argentina, Bolivia, Brazil, Chile, Paraguay, and Uruguay for exploration and monitoring of fire ants and their natural enemies. During this time, 350,000 kilometers were covered, 15,000 fire ant colonies were collected or examined in the field, and some 150 fire ant colonies were hand carried to ARS’s Center for Medical, Agricultural, and Veterinary Entomology’s (CMAVE) quarantine facility in Gainesville, Florida. Scientists at SABCL have studied interactions between RIFA (Solenopsis invicta) and other aboveground foraging ants in two habitats in northeastern Argentina. A combination of pitfall traps and baits were used to study day-to-day activity in ant communities to see how the ants interact with one another. Each pitfall trap consisted of a 50-milliliter plastic tube buried in the ground and half-filled with soapy water, giving the scientists a measure of the diversity and abundance of the ant species at the site. The bait consisted of 1 gram of commercial canned tuna placed on a 5-centimeter-diameter plastic card near the trap. Observations of ants competing for the bait revealed the dominance abilities of each ant species at that site. 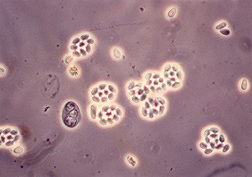 Spores of the microsporidian pathogen Kneallhazia solenopsae, a potential biocontrol of fire ants. Some 28 ant species coexisted with S. invicta in an open area of forest along a watercourse, whereas only 10 species coexisted with S. invicta in dry forest grassland. A more recent, larger scale study of more than 100 ant species in natural and modified environments in northern Argentina revealed that RIFA is the most numerically dominant species in other habitat types as well, says Calcaterra. Before these studies, it was thought that the fire ant was not dominant in its native land. But it proved to be the most numerically and behaviorally dominant, winning 78 percent of interactions with other ants, mainly against its most fierce competitor, Pheidole obscurithorax, an ant of northern Argentina and Paraguay. In a battle with the Argentine ant, Linepithema humile, the fire ant won 80 percent of the time. Though the fire ants were ecologically dominant, the study revealed that other species were able to coexist. “It was possible because of the relatively poor ability of S. invicta to discover the food resources, but it is also due to the higher ant diversity and competitive pressure in its native range compared to its area of introduction,” explains Calcaterra. The presence of phorid flies affected the foraging rates of fire ants but had little effect on fire ant interactions with other ants. 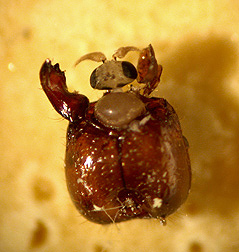 A newly hatched phorid fly emerges from the head of a red imported fire ant that has been parasitized and killed. The technology transfer between CMAVE and SABCL has been mutually beneficial. Overall, 36 shipments were made to CMAVE from SABCL, and they included 397 fire ant colonies (204 infected with diseases, 136 parasitized with phorid flies or parasitic ants, and 57 healthy). The lab continues to look at the biocontrol potential of key candidates—the microsporidia Kneallhazia solenopsae and Vairimorpha invictae, phorid flies in the genus Pseudacteon, the parasitic ant Solenopsis daguerrei, wasps in the genus Orasema, and the nematode Allomermis solenopsii. “Pathogens like K. solenopsae and V. invictae—alone or in combination—are associated with localized declines of 53-100 percent in fire ant populations in Argentina,” says CMAVE entomologist David Oi. And phorid flies, which parasitize and kill fire ants, are now in use in the United States to reduce RIFA foraging and help control some populations. Now, CMAVE and SABCL scientists are looking to add a new scientific wrinkle—using the phorid fly as a vector for infecting the fire ant population with the microsporidia. Though preliminary data showed that V. invictae could not be successfully transmitted to phorid flies effectively, K. solenopsae could be. Oi, CMAVE entomologists Sanford Porter and Steven Valles, and SABCL’s Briano and Calcaterra were able to infect phorid flies with K. solenopsae without harming the flies. The next step is to determine whether infected flies are able to infect RIFA with the microsporidia—providing another mechanism for transmission between RIFA colonies. “K. solenopsae not only reduces fire ant colony size, it also reduces the amount of sexual brood—or reproducing ants, affects queen survival, and increases the death rate of colonies,” says Oi. Other cooperative research between CMAVE and SABCL on biological control of fire ants evaluates ecological interactions of fire ants and phorid flies in different habitats in Argentina. Genetic studies also are being performed at CMAVE with material collected in South America to characterize the population structure of the parasitic ant S. daguerrei and to determine the source population of the fire ants present in the United States and other countries. “Our work continues in order to develop novel technologies and strategies to control red fire ant populations and mitigate their damage,” says Oi.—By Sharon Durhamand Alfredo Flores, Agricultural Research Service Information Staff. This research is part of Crop Protection and Quarantine (#304) and Veterinary, Medical, and Urban Entomology (#104), two ARS national programs described on the World Wide Web at www.nps.ars.usda.gov. To reach scientists mentioned in this story, contact Sharon Durham, USDA-ARS Information Staff, 5601 Sunnyside Ave., Beltsville, MD 20705-5129; phone (301) 504-1611, fax (301) 504-1486. "Controlling Fire Ants Takes a Group Effort" was published in the July 2009 issue of Agricultural Research magazine.